Since the first of April I chose over “Woman In Gold” movies such as “Danny Collins” (good), “The Longest Ride” (okay), “While We’re Young” (awful) and “Desert Dancer” (okay) until today when I went to see “Woman In Gold” which I definitely should have seen before now. The painting in question, “The Portrait of Adele Bloch-Bauer” by Gustav Klimt, was used as a test case before the Supreme court regarding reparation for Jewish descendants whose family art was stolen by the Nazis. It is based on a true story that brought Maria Altman (played by Helen Mirren as an adult and Tatiana Maslany as young Maria) and a young lawyer, Randol Schoenberg (played by Ryan Reynolds) together to fight for the portrait of her aunt, along with other art works, that Austria claimed and saw as their “Mona Lisa”. There are a series of flashbacks throughout the movie showing the Jewish Altman family, society and cultural leaders of Vienna, and what happened to them and their belongings when Hitler and his Nazis marched into Austria. Though many of these scenes are familiar they still resonate with the cruelty they caused on all levels. The major part of the film is the interaction between the unsophisticated lawyer Reynolds and the refined Mirren, who can have a very sharp tongue. The chemistry between the two makes their journey together very believable as does Daniel Bruhl when he comes to their aid as an Austrian journalist aware of injustices of the past on a personal level. Part Holocaust story, part courtroom drama and part history the whole movie is elevated by the acting of the leads especially, no surprise here, by Helen Mirren, who can throw out quips with gusto and whose face can express so much without dialogue. As with most ‘based on a true story’ films much is left out such as Maria having children and what happened to her husband, played by Max Irons, though a major scene and middle portion of the film involves him. Over the credits we see pictures of the real people and we learn what happened to most of them. The direction, especially the Austrian scenes, by Simon Curtis are generally well done as is the screenplay by Alexi Kaye Campbell, though the latter does pull at the heartstrings at points while the score by Martin Phipps and Hans Zimmer adds emotional tension to some scenes. 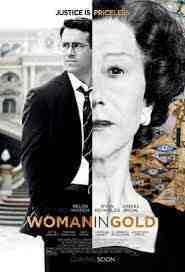 “Woman In Gold” is a movie that pulls you into all aspects of the story to the point of involving you emotionally!